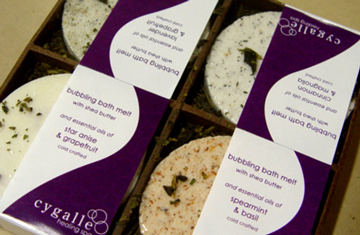 Bath Melt Gift Trays | Essex County Naturals. Single gift trays available in mahogany, midnite black, ivory white, gold, sea green, apricot and sandy brown colours. 2,3 and 4 piece gift trays available in Mahogany colour. For a slightly more upscale style of packaging choose from a wide variety of handmade gift trays. Single gift trays are available in the following standard colours – mahogany, midnite black, ivory white, gold, sea green, apricot, pastel blue or pink and sandy brown. 2,3 and 4 piece gift trays are only available in Mahogany colour. Made from recycled paper materials. For custom sizes, colours and minimums please inquire directly. Check out the gallery below for gift tray colour and option ideas.